I was thinking about my to do list the other day when I realized I haven't yet sent out any Thank You cards to family and friends who gifted us with something over the holidays. I have always had to work extra hard to remember this common courtesy as it doesn't come naturally, although my mom is pretty darn good at it. Getting a simple 'thank you' in the mail is one of the easiest ways to make someone feel appreciated but it is probably one of the arenas where politeness is fading in society in general. In order to help myself stay accountable and pass this habit along to Sebastian I decided to go the creative route rather than making it a chore. 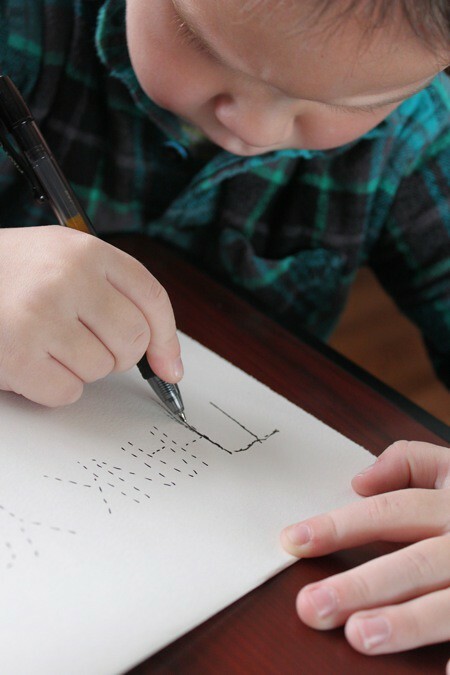 He's been needing to practice writing his letters so what better way to kill two birds with one stone than make connect-the-dots (dashes) thank you cards! I love how focused he was on this little task. He ended up finishing two before he decided he wanted to practice drawing transformers instead and I didn't push it. I figure if we do a few each day it's good practice and we'll cover everyone. I loved to draw when I was a kid but haven't necessarily done any drawing in front of Sebastian other than random coloring and painting sessions in the past. Brett found a rare How-to-Draw Transformers book at the library that we currently need to return (uhh....) that has been really fun. Sebastian gets so nervous about messing up so I'm trying to remind him he has lots of paper to practice on and that everyone has to practice to get better at anything. Since we've recently had freezing temps and a bit of snow it's been a great indoor activity. On a completely different note, I'd love to know a more accurate head count over here as far as how many followers are following, etc. not only through Google Reader but bloglovin in order to give the best stats to my sponsors each month. So, if you'd like to humor me I'd love any regular readers who haven't already followed to add me to their Google Reader or bloglovin list. I've added the option to follow with bloglovin below and the option to update with Google reader on the left sidebar. I truly appreciate it! If you've got kids or a background in education, what other techniques do you use to help kids develop their handwriting? I'm all ears! we do that to! and we also write a word with a yellow hi lighter and pip traces it!!! I think any medium that can be drawn with is good and fun to practice with, not just pens or pencils. As for ways of doing it - I think the only way is to keep practicing writing names and letters - maybe get him to write the names of the Transformers, or other characters he loves? I am a kindergarten teacher. To practice our letters at school we use...SHAVING CREAM! It cleans the tables and everyone has a blast! I am a school teacher and a few of my favorite go tos for handwriting are non traditional. Spray shaving cream on an old plastic lunch tray or platter and let him write with his finger then "erase" with his hand. Messy but he will love it! You can do the same thing with sand or rice. Or give him a clip board and have him go on a letter hunt in your house and write down any letters he finds, sounds simple but kids will do anything if you give them a clipboard! If you happen to have a stand up glass shower, steamed windows at bath time are perfect for practice too! i love this post! 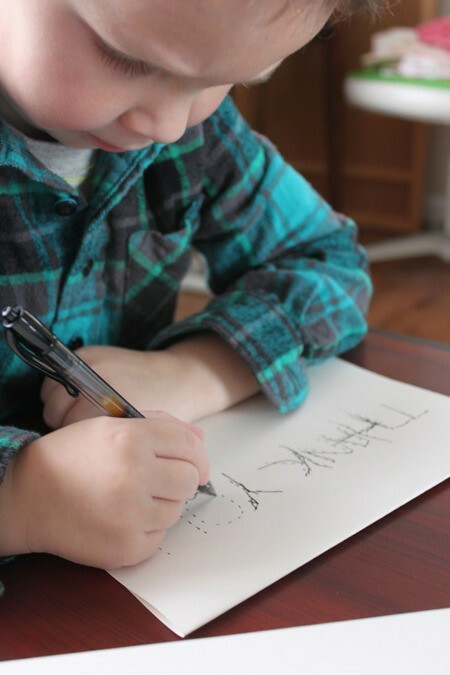 My mom was a stickler for thank you notes, and I want my son to be schooled on it too! Great idea with connect the dots. i am horrible at this common courtesy! the fact that you are even thinking about it makes you so great at it! i am just plain bad! I am an elementary art teacher...I love Ed Elderly drawing books for step by step drawing. As for writing, my daughter's school has lamented statements like "happy birthday, thank you, and I love you" on card stock. They use vellum or tracing paper to place over it and write. She now asks us to write words out and she copies them underneath. I am a kindergarten teacher and I swear by the program developed by occupational therapists, Handwriting without Tears, the kids love it! I most recommend the chalkboards, workbooks and the wooden pieces. I am a hard-core "Thank you" mama over here, since my own mother pounded it into me! Since having kids we've had them have a hand in it too, either decorating the card and now, with my son who is 3 and learning letters, writing his name. We use these to help teach the letters, as they trace them and get a feel for the way to 'write them' (I believe they're a Montessori technique). Then we just practice. It's probably my son's least favorite thing, but hey, with writing about 10 words a week, I'm happy! this post is so cute! I love the look of concentration on his little face. To encourage both drawing and writing, consider getting a giant white board. I know chalkboards are the thing people go to now days, but we've done both chalk and white boards with our kids and the white boards just end up being more practical. (3 kids on a giant chalkboard can make quite the mess) We've had a large (3' x 4') board for 3 years now and it gets used daily. It also saves a lot of paper. I LOVE this idea as a way for kids to get involved in writing thank you notes that are too young to actually write them. 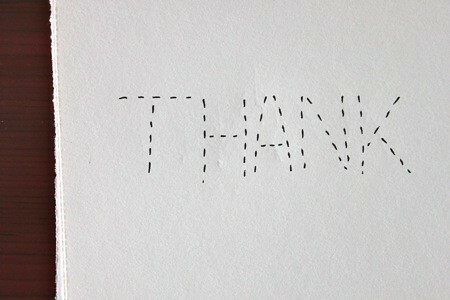 It saddens me that "thank you" cards seem to be a lost courtesy these days. That is a great idea! I am a preschool teacher and one of the things we do is lots of play dough activities....I know you're thinking for writing? But YES!!! This activity helps strengthen and promotes muscle coordination in little hands to help them as they begin to write (and use all those new hand muscles). Good luck Sebastian! I have 2 boys, ages 4 and 7, and I have to admit, their attention span is very short - we use mini chalk boards to practice our letters! And I just learned that using something small to write with (golf pencil size) helps them get comfy with their grip - so we have broken all of our pencils, crayons and chalks in half, and I have seen such an improvement in their handwriting, especially in my 7yos (he's a lefty). 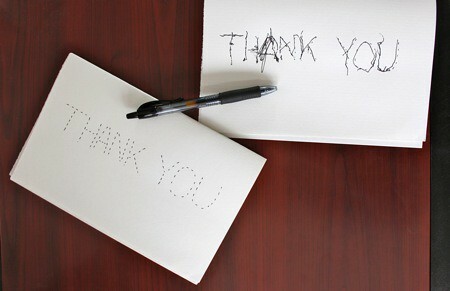 Teaching kids to write thank you notes is so important--and I think this is one of the cutest ideas I've seen for it! Avoid markers as much as possible for the start as he needs to learn to exert enough strength in writing so as to have a better grip. Pencils and crayons are still the best. play with dough - the kneading, rolling, pinching and all help develop his fine muscles. which will definitely aid in his writing. the key is to develop his muscles first. when his fine muscle are ready, learning to write will be a breeze! I am a teacher and I have typed out a page of the students' name in ZB Manuscript with lines (found here: http://www.abcteach.com/font_details.php). Then I laminate it and have the students trace it with dry erase marker. You can also do this with the alphabet, sight words, etc. I used to teach pre-kindergarten and I would write out words, names, or letters with a yellow marker and have the kids trace them. You can also put sugar in a cookie pan and have them write letters in that with their fingers. Love your blog! Thanks for the reminder, I will now be making thank you cards with my kids. My son is 3 and to practice drawing, every morning we will read a story from his Bible and then I have him draw a picture of what we read about. He has a special journal that he draws in and he looks forward to it each day. Great idea! I love that it is good practice (writing and thoughtfulness!) which results in an adorable card. Thanks for the inspiration! 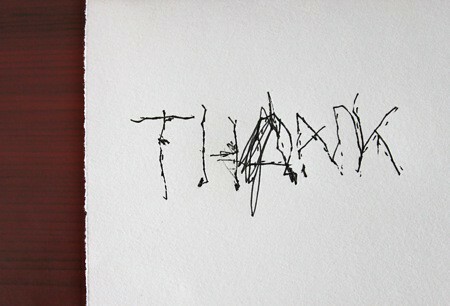 I love the intense and focused look on your sons face while tracing/writing his thank you. so stinking cute. Coming from an artist the BEST book to get Sebastian is called "Beautiful Oops"! I found it by mistake while looking for a book for my cousins baby shower well. It has now become my book to give anyone and everyone! I use to nanny and I'm still really close with the family... while visiting and exchanging Christmas gifts I told the olderst now 11 that i wish I had found this book when she was a kid because like Sebastian she would get frustrated over mistakes and would try to hard to make every craft or piece of art 'perfect'. I work with preschool children. One activity kids love is to fill a Ziploc bag with shaving cream and then seal it tightly. They can practice writing on the bag with their fingers as the lines they make disappear. It’s fun and less mess for you. Also, to get a good grasp while writing...have a crayon breaking event. Can you imagine? Breaking crayons on purpose? Coloring with broken crayons forces kids to have a better grasp. it allows you to use many different styles from manuscript to the Handwriting Without Tears font. You pick the line style, font size, shade depth, solid or dashed,... you create the wording to be done. It's awesome. You make your own sheets and print them out! My 6 year old uses it to write ut his poems, tooo cute. My 9 yr old is now using it to write cursive snail mail letters. Hope that helps. I LOVE this! I will have to try this with my girls! 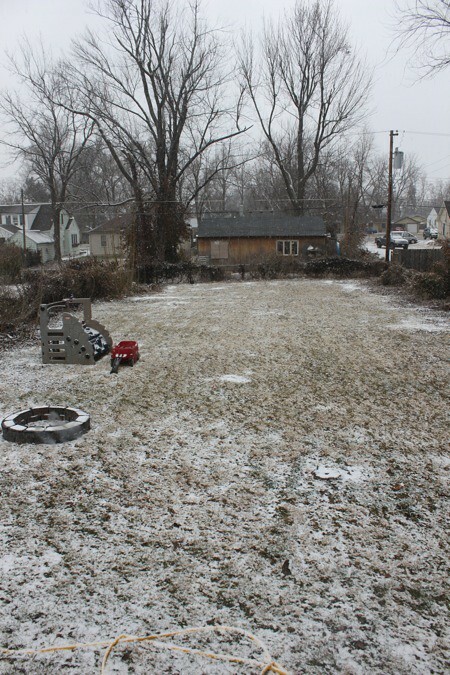 I am such a lazy blog reader, I was just skimming to look at pictures and noticed the finished product. I thought "that font is so cool", then I actually read the post and realized how the card was made. What a great idea! we happened upon some really awesome wipe off boards when my daughter was only 2. it had the alphabet, upper and lower case, along with 0-9 numbers to trace. she would literally sit for hours, over and over again, writing, wiping off and starting again. she's only in kindergarten, but was writing and reading over 18 months ago...i believe boards are made by "board dudes"